Thank you so much for making this happen for us. I felt like we had absolutely the best team on our side. You are all truly amazing and we are oh so very appreciative. That was the gist of Federal Reserve Chair Janet Yellen’s post Federal Open Market Committee meeting press conference. Of course, we’ve heard that before. If you can remember back to May 2013, when then Chairman Ben Bernanke said what we all knew, I’ll paraphrase “hey, at some point, the economy will be strong enough we can shift back towards more normal monetary policy.” Markets freaked out. 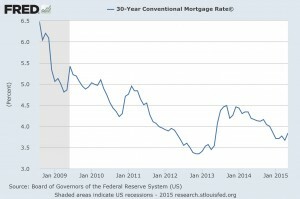 That caused about a 1% spike in treasury yields and mortgage rates between May and June 2013. Since then? They’ve done nothing but drift lower. Well, that is, until May’s jobs report on June 5, 2015. That’s when we saw about a .25% spike in rates. Tiny, by comparison, but it’s the backdrop that tells me this isn’t another head fake. You’ll see that spike from the lowest point in history, around May/June 2013. Then, that slow, steady drift lower, until that last little spike two weeks ago. What sticks out to me, is that from a “technical” standpoint, the latest floor in rates (about January/February of this year) was not quite as low as the prior floor, the lowest point in history, from the end of 2012 through spring 2013. At least as importantly as the “technical” aspects of market movement, are the economic fundamentals. Since spring of 2013, the US has brought some 3,000,000+ people back into the full time labor force. We’re seeing increasing traction on wage increases, whether by the likes of McDonalds and WalMart, or specific states and municipalities hiking their minimum wages. Not to mention, that for the skilled labor force, earnings have been steadily increasing, for some time. Household balance sheets are as strong as they’ve ever been, and? People are still saving at what has become an “abnormally” high rate, hovering around 5% (instead of about 0% which had become the norm until the market meltdown). Corporations, having been the first to shave costs, are pretty strong, lean operationally, flush with cash, and ready to grow, whether by acquisition or increasing sales, since demand has been picking up too. There’s little doubt that the economy both domestically and globally is improving. As such, rates will rise. Even economic data out of the EU are picking up steam, and they’ve only begun their quantitative easing program. In Japan, where they’d gone about 30 years without any real price increases or economic growth, they’re beginning to see inflation pick up, and along with it, some long-overdue economic expansion. 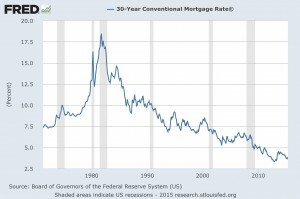 What I think we’re going to see with interest rates is essentially the reverse of the trend that began in 1981, when rates basically began their 30+ year downtrend. Each spike in rates during those thirty-some years, and there were many, was lower than the prior spike on a long, steady move to those historic lows. They were essentially all head fakes. 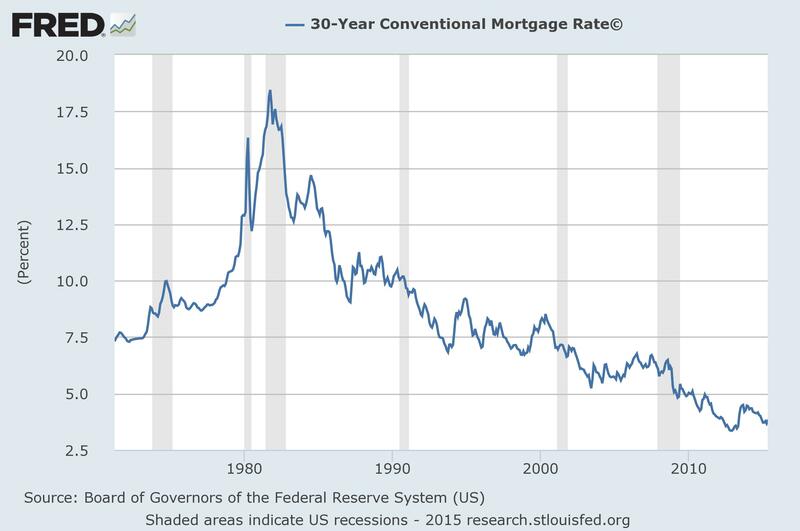 Similarly, I think we’re going to see rates begin to climb, slowly and steadily. Much like the 30 years that got us to these lows, it’s unlikely to be a straight-line trend. 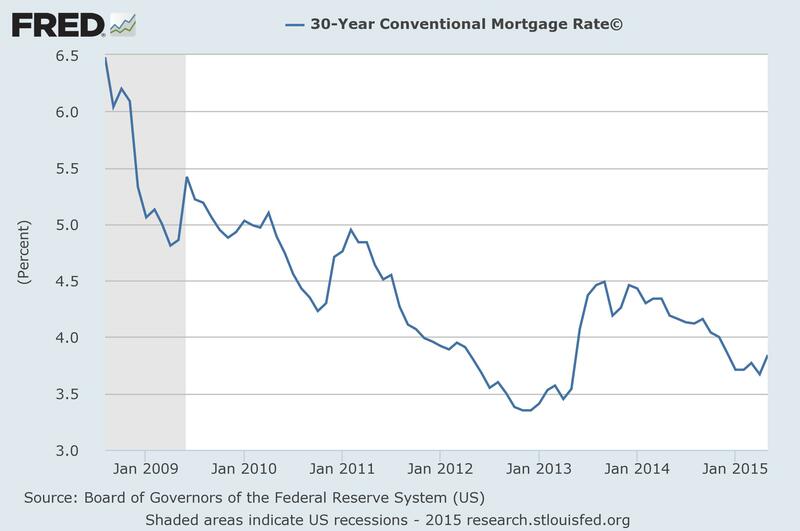 There will be dips, and windows of opportunity to secure lower rates, but I think the underlying trend is up. And each dip is – for the most part – likely to be shallower than the last. To be sure, there are some people who think deflation and lower rates (trying to fight deflation) are still ahead of us. They site data about debt deleveraging cycles (primarily from Carmen Reinhart and Kenneth Rogoff, http://www.reinhartandrogoff.com/) and point out that the world hasn’t really deleveraged at all. They highlight that the deleveraging accomplished by individuals and corporations merely shifted to the balance sheets of governments across the globe due to their Quantitative Easing. The day of reckoning still lies ahead, they proclaim. They could be right. They could be wrong. Sure, we’ll have another economic meltdown. I think those have happened since economies and markets were formed – Dutch Bulb Crisis/Tulip Mania, anyone? In fact, I still urge my financial guy to use stop losses. We got lucky timing again, selling a bunch of stuff and taking gains in April or so. Since then, stop losses have protected other shares as the stock market has gyrated sideways to down. But on the whole? I’m generally optimistic about the direction of the economy. I just have no idea how that translates into opportunities with my equity portfolio. That’s why I hire a professional. On the interest rate front, I have a bit more insight, but…it just boils down to the same thing, lower rates are better for borrowers. Plain and simple. We have low rates now. Still. We “think” they’re going to go up. We really have no idea when, by how much, and how fast. What the Fed does is only part of the picture. In fact, and Janet Yellen mentioned this specifically today, and David Rosenberg, economist at Gluskin Sheff echoes these thoughts: it’s not the timing of the first hike of the Federal Funds Rate that people should focus upon. Of course the media does. They need something to discuss in their 24-hour news cycle. But, more important are the long-term trajectory and pace of those increases. In fact, Rosenberg asserts, it’s the late stages of the tightening cycle that typically begin slowing economic tailwinds. Those are still likely years away. Does that mean that “liftoff” will be smooth sailing? Definitely not. Volatility in bonds, mortgage backed securities, and equities is likely to remain high. After all, this is completely uncharted economic territory. And, the Fed still has to decide what they’ll do with their massive balance sheet. So far, they’ve agreed to continue reinvesting proceeds of their holdings, which, to be sure, that is still very accommodative policy. But, whether they decide to just let them expire, without reinvesting, or actually selling their holdings becomes a larger question. One that maybe I’ll try to tackle in another newsletter. At least, if I can get my head around the implications and how they’re relevant to those of us looking to borrow money for real estate. Until then, I’ll do my best to keep you posted on what direction rates are headed, and my take on why. In the meantime, here are your rates for this week. Please keep in mind, these rates and statistics are for informational purposes only to give you a sense of market movement and my opinion as to why. Although these rates exist today, based on certain qualifying characteristics (740+ fico, owner occupied SFR with 75% loan to value ratio or less), your scenario may allow for lower or higher interest rates. Licensed by the CA Dept of Real Estate, #01760965. NMLS: 239756. Equal Opportunity Housing Lender.